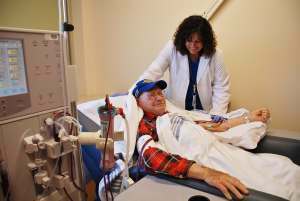 WMH hospital is proud to provide high quality dialysis services to our community through Chippewa Dialysis Services. Under the medical direction of Dr. Mohammed Haider, the caring staff makes certain this life-saving and life-enhancing treatment is available to patients from across the Eastern Upper Peninsula and beyond. Located in the WMH Medical Office Building at the corner of E. Spruce and Osborn Boulevard, the department is open 12 hours a day, six days a week. Visitors to our area may call the department to check on the availability of service as well.